For hundreds of years, practitioners of herbal medicine have recommended stinging nettle as a treatment for the pain of arthritis and gout, for anemia, allergies and urinary problems or as a topical treatment for eczema, insect bites and painful muscles. The root and leaves of the plant contain several identified compounds that are biologically active, including flavonoids such as quercetin that have antioxidant properties. Antioxidants help remove free radicals from your body; these unstable chemicals can damage your cellular membranes and DNA. Nettle also contains several other compounds, including beta-sitosterol, a plant chemical with a structure similar to cholesterol that can benefit your heart by lowering absorption of dietary fats by your blood. Consuming stinging nettle tea may help prevent seasonal allergies, or improve symptoms such as sneezing and itching caused by allergic rhinitis if you already have this problem. 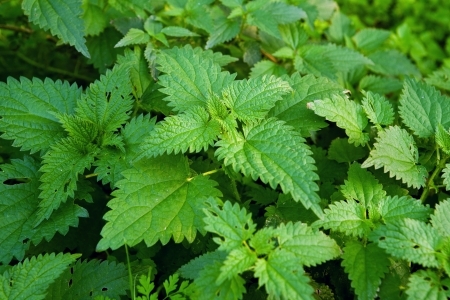 The results of a clinical trial of stinging nettle as a possible aid for allergies was published in the journal "Planta Medica." After consuming a dried preparation of stinging nettle for one week, subjects with allergic rhinitis experienced a lessening of symptoms compared to a placebo group. Although this study suggests that nettle tea might be beneficial for allergies, this was a small trial and larger studies are needed to confirm its benefit. Preparations made from stinging nettle are traditional remedies for urinary tract disorders, especially benign prostatic hypertrophy, or BPH, in men. This non-cancerous condition causes enlargement of the prostate gland that can interfere with urination. Today, stinging nettle is widely used in Europe to treat the problem. Clinical research supports the herb's usefulness for relief of BPH symptoms. For example, in a trial published in "Journal of Herbal Pharmacotherapy" that lasted six months and involved more than 600 subjects with BPH, 81 percent of subjects who consumed a nettle preparation experienced lessening of symptoms compared to a placebo group. In addition, Memorial Sloan-Kettering says that nettle may slow growth of prostate cancer in laboratory animals. However, clinical studies with human subjects are needed to confirm this possible benefit.